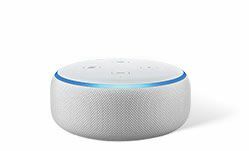 Receive an all-new Echo Dot when you sign up! What is an Amazon Echo? Amazon Echo devices are voice-controlled speakers designed entirely around voice – it's always ready, hands-free and fast. Alexa is the brain behind Amazon Echo – just ask Alexa to play your favorite playlist, set a timer while cooking, switch your lights on and off, change your homes temperature, or even check your weather. Just with your voice. Now you can even interact with Direct Energy. Alexa is Amazon's voice assistant. Now you can perform tasks without lifting a finger. 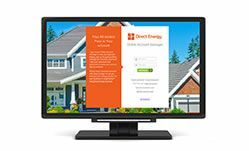 Direct Energy's Skill on the Alexa platform enables you to ask Direct Energy to check your account balance, your bill due date, refer your friends, and manage your energy usage*. It connects to your Direct Energy MyAccount to give you the accurate answers you need. What Can Alexa Do with Direct Energy? We've taught Alexa a few actions so you can interact with us. "Alexa, ask Direct Energy when my bill is due." "Alexa, ask Direct Energy how much I owe." "Alexa, ask Direct Energy for my weekly usage." "Alexa, ask Direct Energy for my monthly usage." "Alexa, ask Direct Energy for my yearly usage." "Alexa, ask Direct Energy for my Refer-a-Friend code." "Alexa, ask Direct Energy about the company." Have a Hive Smart Thermostat? Now take even more control of your energy usage by enabling the Hive Alexa skill to lower and raise your temperature through your device. 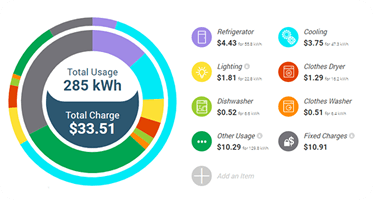 Our energy usage insights tools help you see, understand, and manage how you use energy in your home, helping make sense of your charges and enabling you to lower your usage and save money. We really are the energy company that wants you to use less of what we sell. Now, you can ask Alexa what your weekly and monthly usage trends will be by saying "Alexa, ask Direct Energy about my weekly usage." Get your Amazon Echo or Echo Dot and plug it in. Download the Alexa app, search "Direct Energy" and tap enable. See our Skill terms and conditions. When will I receive my Echo Dot? Once you place your order, you will receive your Echo Dot within 4-6 weeks. Who is Alexa and what is an Alexa skill? Alexa is Amazon's voice service, accessed through the Echo Dot. Alexa skills are voice-driven capabilities that work like apps. You can enable and disable skills, using the Alexa app or a web browser, in the same way that you install and uninstall apps on your smart phone or tablet. You can add Alexa skills to your Echo to bring products and services like Direct Energy to life. How does the Echo Dot work? 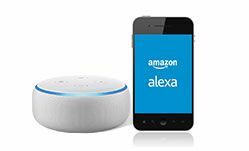 When you want to use Echo Dot, simply say the wake word, "Alexa," and the Echo Dot lights up and streams audio to the cloud, where the Alexa Voice Service is leveraged to recognize and respond to your request instantly. Where can I find the Direct Energy skill? You can find the Direct Energy skill on the Amazon Alexa app, as well as on amazon.com, ready to be enabled. How do I set up the Direct Energy Skill? To set up the Direct Energy Skill, you will need to download the Alexa App, create a Direct Energy Account (if you do not have one already) and add the Direct Energy Skill. For more information on setup please visit: www.directenergy.com/alexa-skills. There is an instructional sheet insert in the package that will also walk you through the process. How does the Direct Energy Skill help me manage my account? 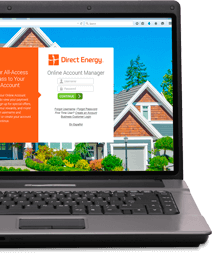 Direct Energy's Skill on the Alexa platform enables you to ask Direct Energy to check your account balance, refer your friends, and manage your weekly, monthly and yearly usage. Is Wi-Fi required when using Alexa and the Echo Dot? Yes, Wi-Fi is required when using Alexa and the Echo Dot. Does the Echo Dot work together with the Echo? Yes, the Echo Dot will work with all other Echo devices in your home. Does the Echo Dot work with my Hive? Yes. You can connect compatible smart home devices to Alexa using Alexa smart home skills. See https://www.amazon.com/alexasmarthome for compatible smart home devices. What do I get with the Direct Energy skill? Can I turn off the microphone on Echo Dot? Yes, you can turn off the microphone of Amazon Echo by pushing the microphone on/off button on the top of your device. When the microphone on/off button turns red, the microphone is off. The device will not respond to the wake word, nor respond to the action button, until you reactivate the microphone by pushing the microphone on/off button again. Even when the device's microphone is off, Amazon Echo will still respond to requests you make through your remote. How does Alexa work with smart home devices? Alexa enables you to control and check the status of a variety of smart home devices, such as lights, outlets, cameras and thermostats. See compatible smart home devices . You can connect compatible smart home devices to Alexa using Alexa smart home skills. You can also directly connect certain smart home devices to Echo Plus using its built-in smart home hub. We may receive information about smart home devices you connect to Alexa, such as device type, name, features, and status. We may automatically update the firmware for certain devices on behalf of the applicable manufacturer. My Echo Dot stopped working! What do I do? Contact Amazon's customer service, and they'll be more than happy to assist you. **Use of the Direct Energy skill on Amazon's Alexa Service (the "Skill") is conditioned upon your acceptance of our Terms and Conditions. Please read all applicable rules, policies, and terms including those with Amazon.com ("Amazon"). Use of the Skill is voluntary. By installing the Skill, you are authorizing Direct Energy to share your account information with Amazon to fulfill your request, which will then go through the internet to your Alexa-enabled device. It's possible that your interactions with the Skill may be recorded. Consult your agreements with Amazon to learn more. Amazon, Echo, Alexa and all related logos are trademarks of Amazon.com, Inc. or its affiliates.